The bake-sale is over. It was lots of fun and we raised quite a bit of money for the kids. Many parents donated baked goodies and it was fun seeing how creative they with packaging and wrapping. Watching what went first and who bought what was also very interesting. Rice Krispie Treats, some with M&M’s and some without, were a hit with school-age kids, and I can see why companies like Selma’s cut them big and sell them individually. Nice profit margin, too. Next time, I’m going to make giant Rice Krispie Treats. Individually wrapped, colossal brownies were popular with 9 and 10 year old girls. Smaller brownies were also strong sellers, but the big ones went faster even though the smaller ones were priced at a “2 for 1” rate and the bigger ones were 1 single price. It might be impossible to have too many brownies at a bake sale. One parent, a professional cake decorator, donated some animal cupcakes. Those were popular with preschoolers. There was some sort of crumb cake swirled with raspberry preserves and topped with chocolate chips. It was popular with dads…..and me. I’m going to make that soon. It looked like it might be this recipe, but with chocolate chips thrown in. Gingersnaps were purchased mostly by grown-up females. Some types of cookies were ignored until I put them in certain areas of the table. Changing the position of a cookie influenced how quickly it sold. Marketing 101, I know. Still, it was fun seeing it in action. Plain sugar cookies iced with white frosting and decorated with blue frosting were even more popular than frosted cupcakes. Kids liked the frosted sugar cookies, but parents who tried them came back for more because they actually tasted good too. A lot of people asked if things contain nuts, so next time it might be a good idea to write “no nuts” on certain items. Like placement, signage mattered. We had signs saying how much things cost, but next time I might ask people to make labels. Customers seemed to have fun just perusing the table and looking at stuff. They probably would have enjoyed it even better were there more signs. We priced a lot of things at $1.00. For instance, a cupcake might be $1.00 or a pack of two cookies $1.00. Something larger might be $2.00 and some very small cookies might be .50. Since bake sales are usually for a cause, people don’t quibble much on prices. The important thing is to round things up or down so you won’t have to waste a lot of time giving change. I’m commenting to ask you if you wouldn’t mind providing what the prices were for the bake sale. I’m asking because I’m setting up a bake sale in a few weekends locally, and I’m not really sure what’s overpriced or selling myelf short. I would really appreciate any response, here or at my email. Once again, I love your site and what you do. Thanks! PS, Fuzz is adorable! 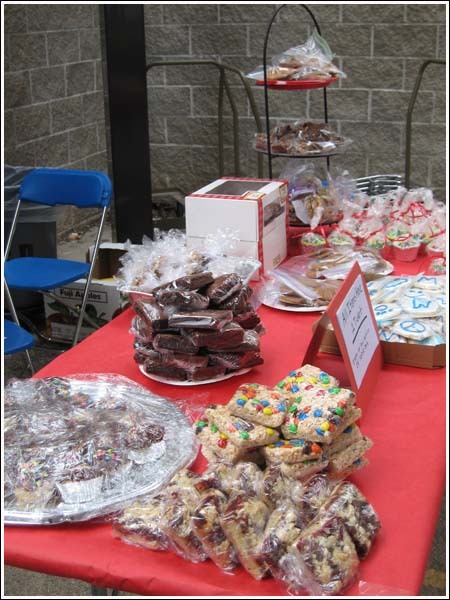 For this particular bake sale, most of the recipes were contributed by parents, so I don’t have all the recipes. You should find some similar recipes here on the site. If you need anything particular and can’t find it, shoot me an email and I’ll send you what you need. I can see why your bakesale was a big sucess.But why didn’t you leave the recipes. That poor cow had been in our junk room for a year. I was really happy to get some use out of him. Now he’s in the trunk of my car. Wow! 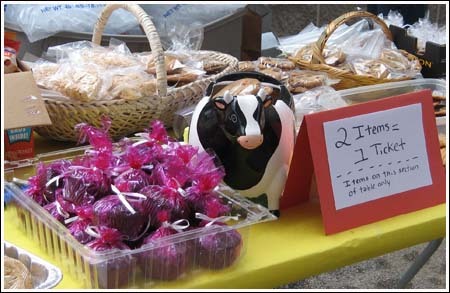 I’m impressed with the professional look of your bake sale. Baskets, trays, platters and a cute cow to boot! A lot of bake sales I see are heavy on the paper thin brownies and store bought cupcakes. You all did a great job. And the raspberry bars sound good.